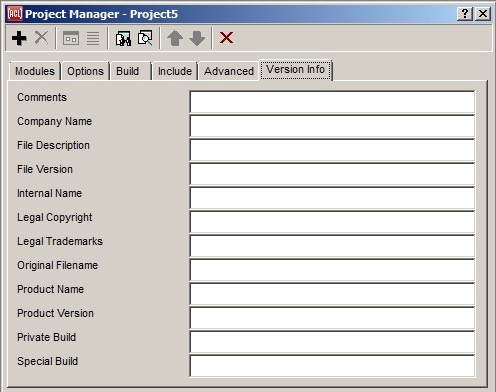 This tab on the Project Manager dialog allows entering version (and other) information about the standalone application for the project, which is used by the Windows operating system. The information is ignored on other platforms. If an end user uses the Windows file manager to show the properties dialog for your application, for example, there will be a Version tab that lists this information. It is a good idea to always fill in some of these fields, because otherwise the Version tab in the file manager will contain only empty fields, though almost all applications supply information for some of the fields. The information is stored as the value of the ide:project-file-version-info property of the project, in the form of a property list. The File | Build Project Distribution command will pass the plist as the :file-version-info argument to generate-application, which will call the function win:set-file-version-info to modify the .exe file that has been placed into the distribution directory of the project. You could call win:set-file-version-info yourself on the project's .exe file, if desired.